To face the world with safety, Catholics must have knowledge and character—they must know their religion and live it. The revolt from authority in religion, which began in the sixteenth century, has now become a revolt from authority in conduct as well. Outside the Catholic Church there are very few nowadays who give a thought to what is God’s will—the point of view of faith—God’s plan. To the Catholic heart, this indifference brings great sadness, but there is something sadder still; the world is actually in revolt against God, it is attacking God, blaspheming the good God, and doing its very best to banish God, His Christ, and Christ’s Church from among men. The fiercest of the fight is around the souls of our little ones, for they know that they have won the war if they can blot out the image of God from the souls of His children. There are many religious bodies that call themselves Christian, but not one of them can withstand this anti-God campaign, except the Catholic Church—the true Church of Christ, built upon the Rock, St. Peter, and against which the gates of hell shall never prevail. Every loyal son of the Church, therefore, is bound to do what he can to be ready and to prepare others to fight successfully the battles of Christ the King. Here is his textbook, and we wish it Godspeed. 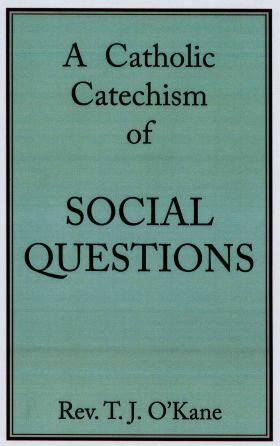 This Catechism of 84 pages was originally published by the Catholic Social Guild of Oxford England in 1936. It contains all of the essential teachings of the Church on man’s nature, purpose, and destiny, as well as his fall and redemption. There are sections on the divine and natural law, the right to life—one’s own and that of others— as well as extensive Q&A sections on education, marriage, private property, wages, the family home, the state and Catholics in politics. This is a great teaching tool and very much needed today in America. Seeing that the defense of faith and morals and perhaps in a greater degree their propagation, is becoming more and more the work of the laity, what could be more opportune than the publication of this little book? Here, indeed, is the primer of the lay apostolate. A priest working on the mission in an industrial area meets, on a small scale, everything that is evil in the big, big world. Hence it is that Father O’ Kane in writing a catechism to meet the needs of his own people has produced a work that will be useful everywhere and to all. The Catholic Social Guild was quick to see this, and deserves well of the community for having made it accessible to all. To face the world with safety, Catholics must have knowledge and character—they must know their religion and live it. The revolt from authority in religion, which began in the sixteenth century, has now become a revolt from authority in conduct as well. Outside the Catholic Church there are very few nowadays who give a thought to what is God’s will—the point of view of faith—God’s plan. To the Catholic heart this indifference brings great sadness, but there is something sadder still; the world is actually in revolt against God, it is attacking God, blaspheming the good God, and doing its very best to banish God, his Christ, and Christ’s Church from among men. And the fiercest of the fight is around the souls of our little ones, for they know that they have won the war if they can blot out the image of God from the souls of his children. There are many religious bodies that call themselves Christian, but not one of them can withstand this anti-God campaign, except the Catholic Church—the true Church of Christ, built upon the Rock, St. Peter, and against which the gates of hell shall never prevail. Every loyal son of the Church therefore is bound to do what he can to be ready and to prepare others to fight successfully the battles of Christ the King. Here is his textbook, and we wish it Godspeed. H. Forbes, St. Peter’s College, Bearsden. Feast of St. Joseph, March 19, 1936. In view of the nature of this book, it was deemed inadvisable to burden the text with references and footnotes. However, a list of books has been included for two reasons: firstly, to acknowledge the help which the authors and publishers have afforded in compiling the present statement; and, secondly, to enable the reader to pursue a wider study and form a better acquaintance with the questions under review.